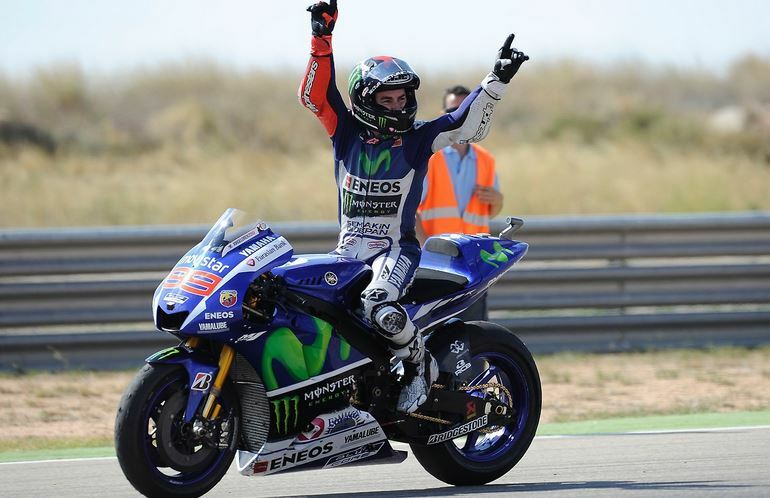 Movistar Yamaha’s Jorge Lorenzo was able to decrease his points deficit on team-mate Valentino Rossi this weekend, as he dominated in front of his home crowd at Aragon. In classic Lorenzo style the Spaniard took the lead on the opening lap of the race and remained unchallenged for the duration of the race as his competitors crashed and battled it out for the other two positions on the podium. Now with a gap of just 14 points to Rossi with four round remaining, the championship fight is still well and truly on for Lorenzo. Getting the holeshot into the opening corner from second position on the grid, Lorenzo was determined to make a clear getaway from his competitors. As reigning world champion Marquez chased him, he crashed out of the race from second position on only the second lap, meaning he has failed to finish in the last two Spanish rounds this season. Suffering yet again from his poor qualifying result, Rossi was unable to stay with the race leaders in the early laps which meant he lost critical time to fight for the victory. Caught behind Andrea Iannone on the Factory Ducati, the nine times world champion was able to get up into third position on the fourth lap. Rossi was then locked in a fight with Dani Pedrosa for the last two positions on the podium, meaning Lorenzo was able to pull a bigger gap. Despite shooting into second on the final lap in a tight battle to the flag it was Pedrosa who crossed the line ahead of Rossi, reducing the Italian’s championship lead. Eugene Laverty secured his first top open class finish in his rookie season this weekend, finishing in 14th position as well as one position ahead of his Aspar MotoGP team-mate. Cal Crtuchlow was top Brit this weekend in seventh ahead of Bradley Smith in 8th. Round 15: Motul Grand Prix Japan, Motegi Circuit, 9th, 10th, 11th October 2015.